Please feel free to comment on our "About" page, it's been put together to inform the public as a warning of what we expect to come our way within the next few years and also let them know what we consider to be the real truth concerning the "Man Made Climate Change" issue. Things are progressing reasonably smoothly with regard to setting this site up. SC25.Com Forecast: Overlay Produced With Old Style "Solar Irradiance" Chart. We have put together an overlay onto the original SI graph from NCDC.NOAA.GOV (thanks to the JunkScience archive Solar Irradiance) to show you the expected fall in the Sun's Solar Output during Solar Cycle 24 (SC24). As you can see the fall is very steep when you compare it to what we have experienced in the past 50-60 years (The Modern Day Warming Period). 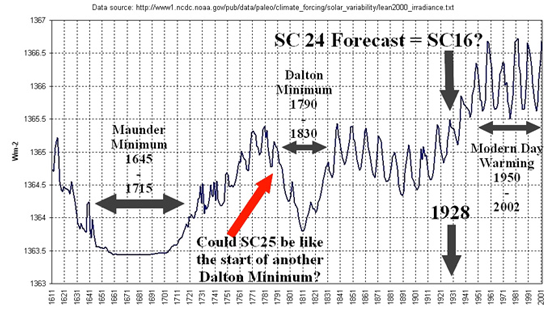 The Earth warmed as a consequence of Higher Solar Activity and NOT "Man Made CO2"
The next question will be how low will SC25 (the next Solar Cycle) be as a result of this, and could we see the start of another Dalton Minimum (the period between 1790-1830) in 10-12 years time, this was the last time our Sun had long term low Solar Activity and our climate went into Global Cooling.